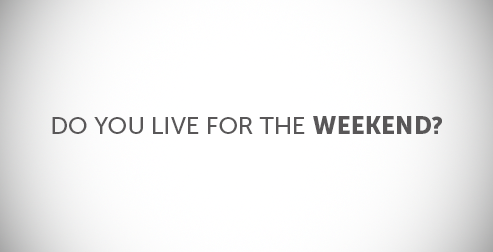 Livin’ for the weekend? What does that mean? What distinguishes those two days from the other five? Is it that a lot of people have to work in the week? Do we become the stuffy, and ‘boring’ person, sat behind a desk, whiling the days away testing how far back their desk chair will recline, and how far away you can get before that paper ball makes it into the bin? There is a new modern social phenomenon occurring, and it’s livin’ for the weekend. We let loose at the weekend. We ‘let go’. Apparently we become ourselves when we aren’t at work. Now, I have a full time job, and I’m sat at a desk, and YES, I often see how far my desk chair will recline. But I don’t feel that I have to keep my real self under wraps because it’s not the weekend. And perhaps most incidentally, I don’t need alcohol to be myself. Now, don’t get me wrong, if I’m gonna whip out the casual dance moves, then it does help an awful lot if I’ve had a little vino, but people shouldn’t feel that a weekend is something to long for, just so they can drink. And I know it isn’t just for alcohol. And it’s to escape work and just chill out, with no stress. But I still don’t understand why, to a lot of people, the name of a day can give way to the abolishment of acceptable social norms and expectations. Because it’s a Saturday, it’s OK for me to get so drunk that I end up in hospital? Is that right? It’s OK for me to be unfaithful, because I’ve had a drink and I’m just ‘having fun’ at the weekend? Now, I am not boring. I’m a former too crazy party girl. I’ve learnt from my mistakes, which often got me in tricky situations. And I know now that behaviour should not differ because we are ‘letting go’. Alcohol can have sometimes less than desirable influences on us and our judgement, but it doesn’t seem to answer for everything. The weekly countdown until Friday is something I am all too familiar with. I’ve been a uni student, and still am. But I’m quite happy enjoying everyday the same. I still love not having to get up early at the weekend, and I like to go out with my friends and have a drink. But has the appeal of the weekly let-go of the weekend created something that justifies bad behaviour, binge drinking and a loss of all sensibility? Is the end of the week alc-binge responsible for the irresponsible shift in social behaviour, often paid for in regret the morning after? Why should we wait until the weekend to do the things we want? Sure, work might prevent us from going away or spending much time doing something we want, but we shouldn’t look forward to just two days of the week. Should we not enjoy all of them, and use time wisely on those precious days off? I don’t know, but the one thing I do know is that I don’t need to get stupidly drunk to have a good time. And if you feel you need alcohol to be who you truly are, then you need to reassess, well, yourself. Hmmm, definite food for thought.